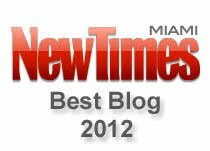 Random Pixels Blog: Miami-Dade County employees: bringin' home the bacon! Miami-Dade County employees: bringin' home the bacon! According to Miami-Dade County mayor Carlos Alvarez's web page, the county has more than 28,000 employees. And according to documents obtained by Random Pixels, 3,301 of those employees made more than $100,000 a year in take home pay for fiscal year 2009-2010. That's more than 10% of the county workforce who are livin' large on your tax dollars. Alvarez once bragged that he had eliminated some jobs at county hall and saved money in the process. But the Miami Herald reported earlier this year that "many of the executives whose jobs disappeared are still working for the county, in some cases at higher salaries." More than 800 of the county employees making more than $100,000 a year are employed by the Miami-Dade Police Department. By comparison, last year Biscayne Times discovered that almost 100 of the City of Miami's much smaller workforce of 4,000 employees made over $200,000 a year. I've uploaded the info here or you can view the document below. Scroll down to see some of the county employees who I've singled out for special mention. Here are some select county employees who are, no doubt, laughing all the way to the bank. Former Miami Herald staffer Matt Pinzur who once covered county government, left the sinking ship at One Herald Plaza for greener pastures two years ago. 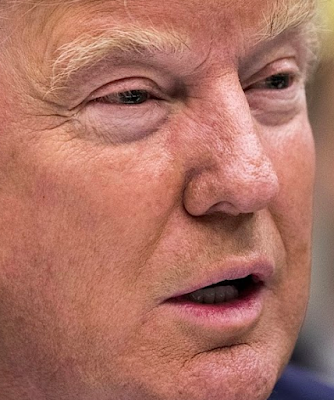 He now pulls down over $119,000 a year as **shocked and surprised!! ** assistant to the Miami-Dade county manager. He also gets almost $2,000 a year car allowance....a perk he could only have dreamed about at the Herald. Click on all charts below to enlarge. Carlos Ortega, a seaport enforcement specialist with 17 years on the job takes home over $101,000 a year which includes over $45,000 in overtime pay. 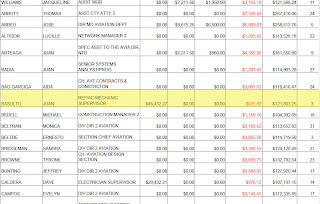 Compare that to the $137,000 a year that Hector Pesquera gets, who as assistant director of seaport security, is Ortega's boss. Pesquera is a retired FBI agent who once ran Miami's FBI office. Next we have a couple of Miami-Dade cops. Lu Ann Belzaguy, an officer with just 13 years on the force, pulls down a jaw-dropping $67,214 a year in overtime pay and takes home $140,431 a year. But she's a slacker compared to fellow cop Brian Benson, a 29 year veteran who makes over $84,000 a year in overtime and takes home $167,000 a year! 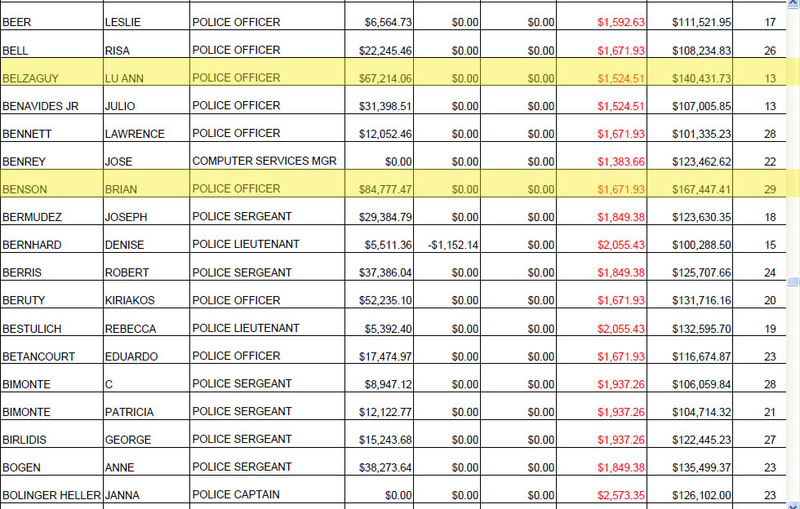 By comparison, Oscar Vigoa, Miami-Dade PD's assistant director only makes $168,000 a year. He must feel like a real schmuck! And let's not forget the money pit that also goes by the name of Miami International Airport. 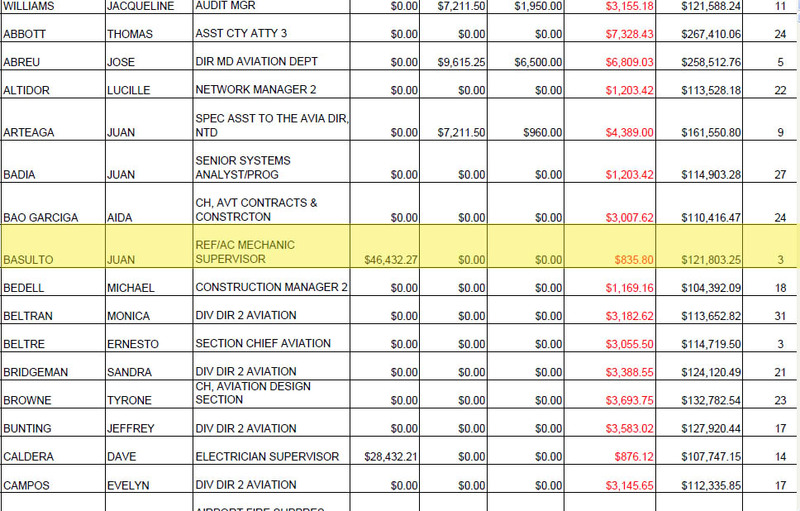 Juan Basulto, a refrigeration and air conditioning mechanic at the airport with just 3 years of county service takes home almost $122,000 a year. That includes over $46,000 in overtime. Thank God for Random Pixels. Apparently nobody else would have thought to tell us about this. Good job, Bill. You made the Herald, too. Yeah, I want a rent-a-cop or inexperienced paramedic when I call 911. Or some underpaid flunky who doesn't care about their job when I need county services. Most on this list worked overtime to excede the 100k mark. And it's generally recognized that overtime is cheaper than hiring a full timer. So what is it you want? Reminds me of some old person who hasn't recognized what inflation has done. Unreal. Great job, Bill. I'm curious as to whether or not these numbers reflect pensions as well. The only high salaries I am ok with are the police, corrections and fire rescue. As a taxpayer I don't mind paying our police and fire guys those salaries. They deserve it. We only call them when sh@# has hit the fan. So, what price are you willing to pay for your life! Five dollars an hour no eduction etc. Nope! not me, I want the best money can buy. Cause I don't know too many people calling police and fire to invite them to dinner.....as the economy gets worse the more the criminals become active! The statistics are there. AHHHHHHH THE MEAN GREEN MONEY MACHINE I LOVE THE COUNTY THAT I WORK FOR AND SPECIALLY WHEN RETIREMENT IS RIGHT AROUND THE CORNER. What??? Take home pay? I wish! 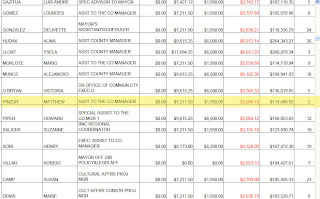 And so do all the other county employees wrongly listed as taking home over $100,000! But no, you are not intersted in hearing that. You are not interested in the TRUTH. I would think, after spending so much time collecting all this information, you would at least want it to be accurate - there is a big difference between take home and gross - like over $25,000 difference, if you are lucky. Miami continues to be the most corrupt city in the United States. Carlos Alvarez shoul resign immediately. We should do a major overhaul of all county operations. I think this will make National news like we always do. I am so furious over all of this especially the Marlins Stadium, Miami Port Tunnel, and local economy. I hope our state government get involved. We are hard working, well trained, loyal and brave employees who risk our lives to protect you ungreatful people. We work all hours of the day and night, weekends and holidays. How many of you would enter a burning building or chase and armed felon down a dark street? Very few police officers and firefighter's BASE pay is over 100,000. News flash, crime is on the rise here in Miami-Dade County and if we did not work more than our 40 hours a week your lives would suffer because criminals would rule the streets! Not everybody is ungreatful, you should refer to some people. I am very grateful for the police and fire rescue workers I paid my taxes happy and I firmly believe they are most of the time underpaid. The review most be in other areas. I'm okay with the ones who have been at it as police, firefighters for 29 years, risking their safety, working long hours, etc. to make $167K. Not as okay for those with 2-3 years as 'assistants' in offices to make that much. What amount do people think is appropriate for police officer with say 20 years experience? is 85K too much, too little? what anout 105? I've been at my legal profession job for 15 years, just starting to hit the 100 mark. This list is VERY misleading, here is my case. 1. Insurance contribution is NOT take home pay. 2. 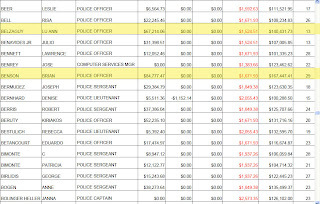 Of my 101k, 22k was paid by the private sector working "off-duty" jobs i.e. Dolphin games, youth fair, things like that. 3. Court pay is not separated. Part of our job is writing tickets and we HAVE TO go to court, this accounts for 19k of my pay. Take into consideration I wrote 352 tickets (during that fiscal year) at an average of $250, I made at least 88k for the state, which in return gives the county funding for police. 4. Many of the officers on the list work the Port of Miami and MIA. There overtime pay comes from the Feds., not the county. 5. Due to a shortage of officers many are REQUIRED to work extended shifts. 6. I worked exactly 0 hours of voluntary, county tax funded, overtime that year. Know the WHOLE story before you get pissed at us for just doing out job. Thanks for yot comment. I will be highlight it in a post tonight. If you can notice on the list, a great number of them have been there for over 20 years and some over 30 years. After being there for that long I think they should indeed be getting pay over 100K. Specially those who hold a director title. Maybe they should be getting more than that. In the private sector they would be. got any tips for other citizens hoping to get hold of similar lists? love how the cop justifies his salary... by taking the money from others... that can only come from a socialist mindset -or dictator. Anon @ 2:34 - the list is a public document. Simply request whatever ist you want from the County Manager's office underr the Freedom of Information Act. This was such a great story and it sent shock waves through county hall. 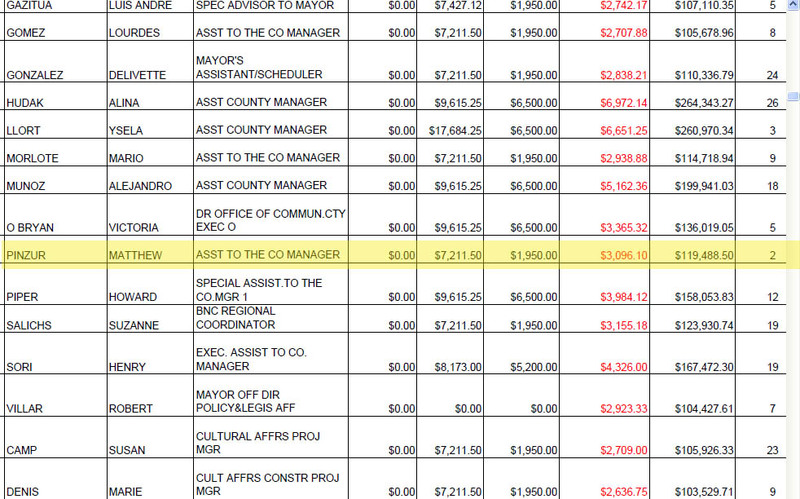 As a county insider, I can tell you that this data reflects cash paid directly to the employee (think W-2 amount). It does not include indirect compensation or non-cash benefits, such as the county's contribution to the pension system (FRS) or to health insurance. Nice job, Bill! Keep up the great work! P.S.If others do the same request, they need to be sure to ask for total compensation paid to the employee (i.e., W-2 data). If they are not specific, the county may try to pass on some other data, like bogus "base-pay" data or a report that doesn't include expense pay or overtime. TSA: It's their business to touch yours! Channel 7, eat your heart out!